I recognize "Pan plus an addition" and Alchemy and Sun-Moon-Star. :-) ... somehow I think of the holy three kings. The is also from an alchemical treatise of the Vallis Novi series,* which also has a Satyr. Under the Sun, Moon, and Mercury are the words "Three and/are One". Under the stems of the flowers it says: "The whiteness forty days after the ashes." (left) "Minor period of the stone"
Between the arms of the central figure: "Let a book of Mercury be placed"
To the left: "If you who read know this figure, you possess the whole science of the stone "
right: "And if you do not recognize, you will be lost and sad. " Above the sun is the word "Father"
Above the satyr, "Ferment of the Work." Near the child: "The Son of the Moon will lay the Stone in the fire - his mother." Above the flaming cart: "I am the true Stone"
Under the central figure: "A moderate fire is the master of the work"
*Florence, Biblioteca Laurenziana MS. Ashburnham 1166 is an old version of the Vallis Novi series. The above attachments is from THE HERMETIC AND ALCHEMICAL FIGURES OF CLAUDIUS DE DOMINICO CELENTANO VALLIS NOVI, 1606. Leaf 19 also has a figure with bagpipes. 694. London, Wellcome Institute MS. 190. 38 folios. 270x205mm. Mid 17th Century. f1r Drawings of distillation apparatus, and a possible filtration apparatus a 'Urinal con il pipio'. f1v Drawings of variety of flasks. f3 Coloured drawings of 4 flasks. The first has four heads in it, and 9 flowers growing out of the neck of the flask, The second has a winged sun and moon set about the neck. The third has within it a naked king and queen embracing each other while three blue flowers come out of the neck of the flask. The fourth has a winged dragon within it and nothing coming out of the flask. These are to some extent based on the 'Donum Dei', but have more elaborate birds at the necks of the flasks. Flask 1. Nine blue flowers emerging from neck of flask. Four heads and grey cloud is shown within. Flask 2. Winged Sun and Moon approach on either side the top of the flask. Flask 3. Three blue flowers emerge from neck of flask. Inside King and queen stand in an embrace. Flask 4. Dragon inside flask, shaded red and green. Flask open at top, nothing in the neck. Flask 5. Two birds fly out of the neck of the flask to the right and left. Between them stands a dragon. Inside the flask are snakes in a layer of liquid. Flask 6. A white bird flies out of the nck of the flask, which has a band of liquid within. Flask 7. Three dark shaded birds fly out of the neck of the flask. A band of liquid is shown. Flask 8. A white bird sits at the neck of the flask. It holds a branch in its beak bearing three blue flowers. Flask 9. Two white swans or geese with long necks fly into the flask, their necks entering the open top. Between them stand a Peacock displaying its tail. Inside at the bottom is a dragon. f5v 'Pater Hermes Philosophorum'. A bearded man in a robe and crowned stand on a grassy island. Beside him is a 16 fold star. f6r A flask shaped like a figure eight and labelled inside 'IAAT' is set at the centre of four globes of the four elements, Ignis, Aer, Aqua, Terra. Below are indicated the four qualities, Sicca, Frigid, Humi, Cali. f7 The flask is set on the top of a cylinder divided vertically into 4 bands. f7v The figure of eight shaped flask stands beside the Sun. f8 The flask stands beside the Moon. f9 A beared man in a white robe gestures to a figure of eight shaped flask beside him with a pipe growing out of its side. f9v A round disc with three coloured bands has three faces upon it, beside are two flasks, one with a pipe growing out of it with 'IAAT'. f10v Disc with four horizontal layers. f11 Flask with 'IAAT' and pipe stands on disc with four layers..
f12 Disc with two horizontal layers divided by a diameter. The top layer is futher divided by vertiical radius into two regions coloued red and blue. f13 Inside a circular space two moon crescents with faces gaze from opposite sides at a central flask (8 shaped). f14 Figure of man in toga or robe, labelled 'Geber Philosophus'. f15 Within a egg shaped space we see the disc of f12 at the base of which is a cresecent moon. f16 A hand reaches out of a circular disc labelled A.S.A.P.H., its fingers formed into a fist. f17 Flask with 'IAAT' and pipe betwenn Sun and Moon. f17v-18r Figure of man in red and yellow robe is on the left. At the top is 'Aristotles Philosophus'. He gestures towards a man lying on the ground his breast pierced by a arrow, from his lower abdomen a tree grows with red flowers. A moon is on the right. f19 A man set in a ornamental niche holds a book and gestures to the left. To his right is our flask with a pipe. f19v-20r On the left a woman lies on the ground and gestured to a plinth upon which is set a skull. On the right 'Pan Silvanus' with cloven hoofs plays a bagpipes. f20v Furnace/waterbath with space for four flasks. f21 Figure showing distillation from alembic in progress. f22 Figure showing circulation on progress from two alembics linked together. f22v Figure showing distillation from alembic with spiral around it. f23 Furnace shaped like a castle with turrets. f23v Four interlinked circulating vessels. Also double pelican single circulating flask, and the figure 8 shaped vessel. f24 Figure of furnace in form of castle with two turrets. f24v Figure showing distillation from alembic and collection in another flask alongside. From a side branch on this flask liquid is being collected into another flask set below. f33-34r A variety of flasks including elaborate distillation apparatus are shown. Although this manuscript contains some imagery that can be found elsewhere in alchemical texts, such as the alchemical egg (folio 13r), it also includes drawings that are much rarer, or even unique to it, such as the ﬁgures of a dying man (folio 16r) (ﬁg. 6) and a recumbent woman with a skull (folio 16v) (ﬁg. 7). There is a series of imagery of suns, moons, the four elements and alchemical equip ment, as well as one unique image of a clenched ﬁst that is an ancient counting system, using the ﬁngers of the hand as a primitive abacus (folio 14r).31 It is also a mnemonic device and the necessity of an accurate memory is the topic of three folios (8v, 13v and 14r).32 Jung identiﬁed the ﬁgures of the male and female as being those of “Adam” and “Eve” in the Garden of Eden (though the treatise lacks a serpent).33 The originality of the manuscript illustrations validates Obrist’s observation that there were no predetermined schemata that alchemical illustrators felt obliged to follow.34 In this particular case, for example, there is no Ouroboros to depict the unity of matter, nor any birds to represent the spirit, or the distillation process. There is no bizarre hermaphroditic ﬁgure to symbolise the union of male and female in the stone. Instead, the ﬁgure of Pan Silvanus is “to pan,” the Macrocosm in the form of the Microcosmic stone. This Paduan emblem was, in fact, a reinterpretation of a medieval exegesis in which Pan had been equated with Christ. The style of the ﬁgures is related to the classical revival taking place in Padua in the 1440s to 1450s, inspired by Donatello’s pres-ence at the Santo church. Local antiquarians, such as the humanists Cyriaco d’Ancona and Felice Feliciano had provided the initial stimulus to an interest in the antique remains in the Veneto. The ﬁgure of Pan in the manuscript recalls the artist Mantegna’s similar interest in such semi-human forms which he was the ﬁrst to explore in the frescoes of the Eremitani church, as well as in a variety of engravings on the theme of the Dionysia that incorporate pans, fauns and sylvani. Various stylistic elements in the ﬁgure drawings suggest that the manuscript is Paduan, but the most conclusive evidence is in the written script. This accords with hands such as that of Bartolommeo Squarca of Padua in the 1470s, being the same half-rounded, Italianate style that preserves Gothic mannerisms and decorative ﬂourishes characteristic of the North-East region, a mixture of cursive and angular.35 The Paduan manuscript with the folio of Pan Silvanus was copied and further elaborated in the early seventeenth century by the illustrator of a manuscript in the British Library, MS London British Library Sloane 1316. In this copy, Pan (folio 13r) is shown as wearing the sun and moon in his hair and he is labelled: “Ista ﬁcus est lapis pater Silvanus.” (ﬁg. 8) He is seated on the ground, playing some bagpipes and is made to state: “sum lapis philosophorum.” Lost in this copy, however, has been the alchemical numerology and symbolism of the Paduan version, which had referred primarily to his Macrocosmic signiﬁcance as the body of the All. He has lost his former goat’s hooves and his once magniﬁcent bagpipe now retains only one of its seven pipes. In the Paduan original, Pan’s physical components were a metaphoric explication of the physical composition of the universe. His face takes the form of the red sun, while a crescent-moon in his hair stands for his goat’s horns. His body is shown as hairy. The bagpipe that he carries has seven pipes, representing the seven metals and the planetary bodies. Pan is constituted of the four elements in descending order, thus: water (moon), ﬁre (sun), air (bagpipes) and earth (body and hooves). 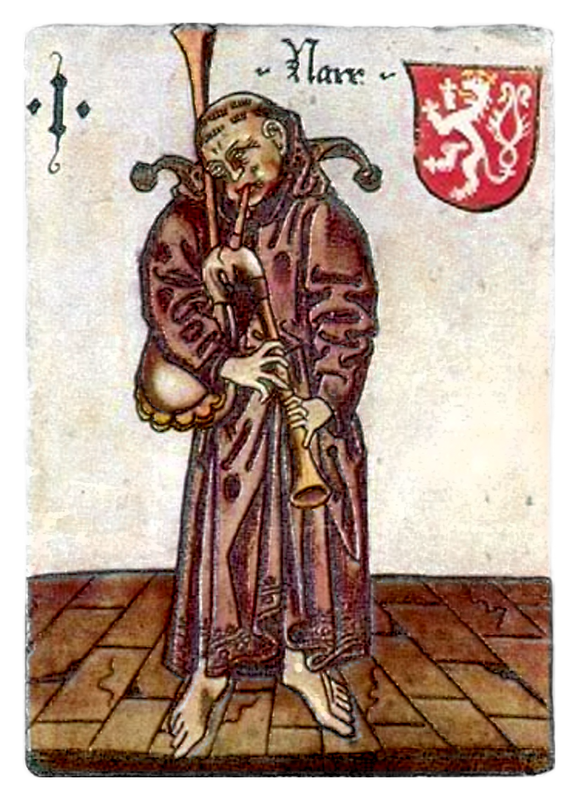 His elemental construction, plus the fact that bagpipe has the shape of an alchemical still, reveals him to be a symbol of the philosopher’s stone. His position in the treatise immediately after pictures of Adam and Eve (sulphur and mercury) dying in the Garden of Eden, indicates that he is their progeny in the form of the perfectly harmonised stone of the philosophers, the resurrected Cosmic Man. The Sacrificial Body And the Day of Doom: Alchemy And Apocalyptic Discourse in the Protestant Reformation, by Urszula Szulakowska BRILL LEIDEN • BOSTON 2006, p.38 'the cosmic body of christ-anthropos'. Good amplification of bagpipe symbolism in relation to Pan and satyrs, Steve. I had no idea. Your last long quote is particularly relevant to the image I posted from Biblioteca Laurenziana MS. Ashburnham 1166, in that it explains the symbolism of the four pipes, clearly visible on that one. 'The cosmic body of christ-anthropos' is pretty good. There also seems to be a visual relationship to the Fool of Parrots that Huck posted back athttp://www.tarotforum.net/showpost.php? ... ostcount=9--although what that Fool is carrying I have no idea. The SB Fool merely has one pipe, with holes for notes. Perhaps there are seven of them, I can't tell for sure (http://www.arnellart.com/osvaldo/taro-cl-sola_busca.htm has a good image). Was that number associated with the holes of a pipe? If so, it would suggest, to me at least, not so much the All of the four elements as a progression, seven stages of the work, perhaps times 3. Mercury as the guide of souls. I am still not convinced that this figure is not also Mercury. "Ferment of the work" sounds like Mercury in its destructive capacity. mikeh wrote: Good amplification of bagpipe symbolism in relation to Pan and satyrs, Steve. I had no idea. Your last long quote is particularly relevant to the image I posted from Biblioteca Laurenziana MS. Ashburnham 1166, in that it explains the symbolism of the four pipes, clearly visible on that one. 'The cosmic body of christ-anthropos' is pretty good. There are seven pipes, not four. 4 straight ones at the top, three curved ones down the side. It's said to be Silvanus, but the text in the background speaks of Helios (?). Silvanus wird häufig mit Faunus oder Pan gleichgesetzt, geht aber möglicherweise auf den etruskischen Gott Selvans zurück. Silvanus was identified with Faunus or Pan, but possibly originated from the Etruscan "Selvans". Thanks for the correction, Steve. The bagpipe that Huck posts seems to have seven stops. I certainly would have thought that was Helios, Huck, due to the aura around his head. I'd guess he was driving his chariot across the sky; but he also seems to be holding a bow. An amalgamation of two gods? That was done a lot in Roman times. Interesting finding, especially the coin.